Summer is still officially ON, at least until later this week, but hints of fall have already begun. Here and there the leaves are beginning to turn colorful and the ferns along the roadside are already brown. We have been feeding hummingbirds all summer long, but there are fewer of them lately. Big changes are coming our way next year. While a part of the Benson family for more than fifty years now, the cabin has always been primitive, with no sewer or water. Carrying fresh water here at 5 gallons per tank and using an outhouse for relief has kept some potential visitors away. We also had our own sauna in place of showers, where sweat and soap got us clean, and lake water rinsed us off. As we said, changes are coming: a well will be drilled and cased this fall, with a pump and water main brought to the cabin next spring. A licensed On Site Sewage Designer has been contracted to go through the county permit process for us, and to install a high-capacity holding tank next spring. Our lot is too low to allow any kind of mound-based septic system, so we will have a sewer truck pump out our tank at least once per year. That is how the outhouse works but this will give us a lot more capacity. Trees have been removed for access to both systems. Last weekend we took down 3 of them for the well driller to have access and last Wednesday the power company took down 4 more where the holding tank will go, plus a standing dead pine, plus 2 more birch which will die next year when the trenches to and from the cabin will be dug. While we are contracting for this work, Brett is looking into expanding the cabin’s floor plan to add a shower and toilet and likely expand the living room. It will be messy around here next year. While all of that was taking place last week, we were also packing up to leave. Yesterday (Saturday) we pulled out early in the morning to get to the Twin Cities area in time to take Olivia to a soccer match in the early afternoon. Today (Sunday) we went to Pam’s place to watch the Vikings tie with the Packers and to pick up some items we will deliver to Arizona for them. Tomorrow we will finish our annual water system disinfecting and flushing, then meet with David and LeJoy and family for dinner. On Tuesday we have appointments in place for the motorcycle and our finances. 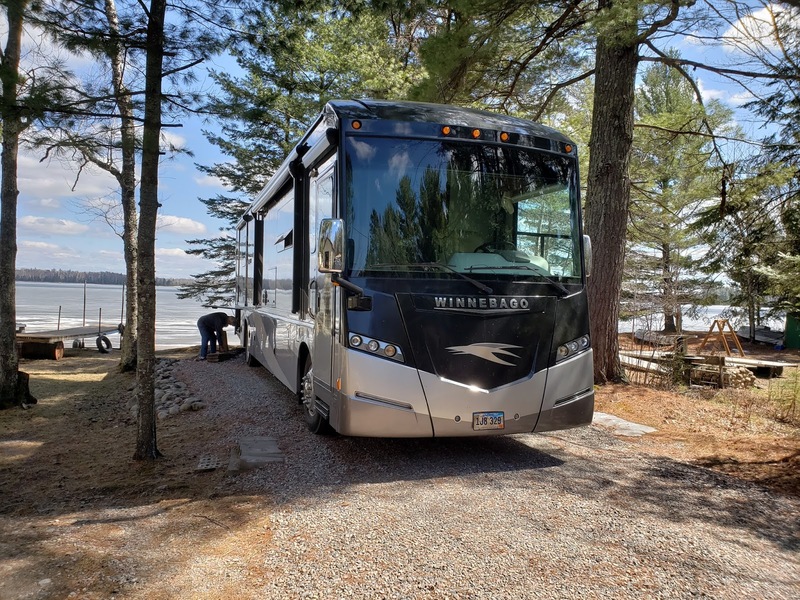 Then we will leave MN on Wednesday for Winnebago in Iowa. That should be a quick stop, then we are off to Memphis for a week at the Nomads’ Annual Meeting where we will catch up with about 1,000 of our best friends. After Memphis, we will head to Paula’s place in Glendale, AZ once again to help her for awhile as she just had knee surgery – again! We have scheduled 4 volunteer work projects during the winter, 2 in Arizona and one each in Texas and Missouri before returning next spring. It has been awhile since we last posted. Seems like not a lot happening in our lives. We have had a lot of short (50 mile each way) trips into Duluth for laundry, medical, and social activities. Both Bob and Joyce have had quite a few medical appointments until this week, when we have had none at all. We had a quick trip to Elk River to pick up our Grand-dog for her “summer camp” while Brett and family are on a vacation out west. Anna planned the trip for them, because she wanted to see the Seattle area. They will return prior to the Fourth of July because the girls like to be here for that holiday. After experiencing this area’s last snowfall of the season, we have had cool, quiet weather. The reservoir is about as full as it can be and the dam is wide open in anticipation of a lot of rain this weekend. We have had a lot of east winds (on shore to us) that have become tiring. On the other side of the peninsula, Steve and Dianna are getting a new deck and landscaping, so we have been checking the contractor’s progress each evening. We have finally made it to the cabin for the summer, but it was quite a journey. When we last posted, we were in Salt Lake City, waiting out the weather. We left the next day but only made it until lunch-time. As we pulled into a rest area for lunch, a fellow traveler pointed out a noise coming from our truck. Paige made a few loops of the rest area while Bob listened and confirmed a strange rattling coming from the underside, like the 4 wheel drive’s transfer case. The smartphone found a GM dealer about an hour up the highway so we pulled in there for an examination. They confirmed that a cover was gone and some type of “keeper” was loose on the front driveshaft. They didn’t have the needed parts in stock, but thought they could get them overnight. We “boondocked” in their parking lot, counting on our batteries and generator while waiting for the parts to come in the next morning. The parts did not arrive. Rather than have us wait another full day, the service writer suggested that he pull the front drive shaft off so that we had either 2 wheel drive or neutral. That plan worked for us so we left about noon, loosing one day of travel time. We went down the highway about an hour or two when “low coolant” and “check engine” icons came on in the motorhome. Another check of the smartphone helped us find a diesel service outfit on our way. This stop only cost us about 2 hours (and $200) where they checked the on-board diagnostics, reset the fault codes, and added a gallon of coolant. We were once again on our way. 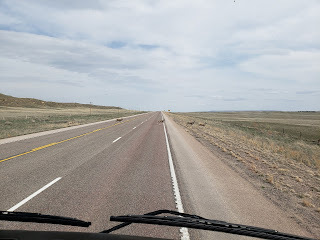 Having proven that we could spend the night without full hookups, we decided to do it again by spending Thursday night in a WalMart parking lot in Casper Wyoming. We got cell phone service late morning as we came into South Dakota and got near Rapid City. 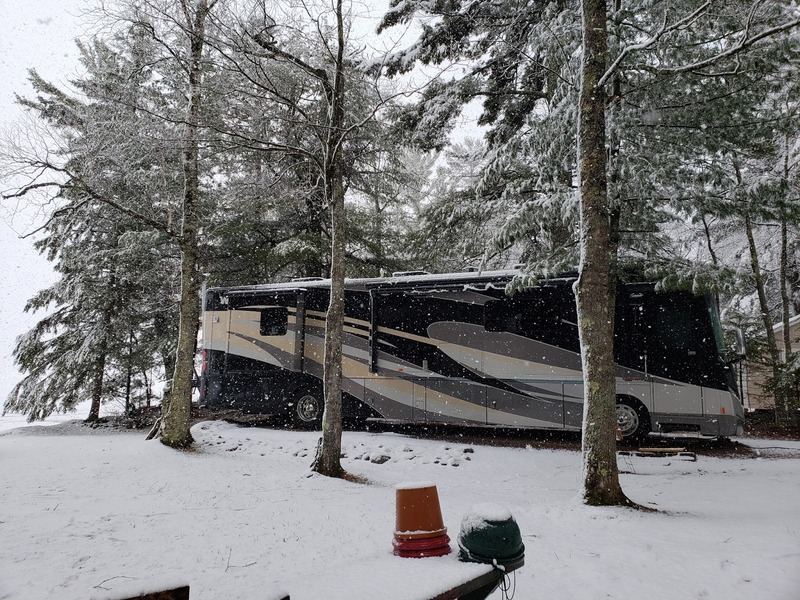 Most of South Dakota was hard hit by a snowstorm last week and we soon found that the RV parks around Mitchel and Sioux Falls are not yet open, so we planned on boondocking once again. Sioux Falls has 3 WalMarts to choose from, but none of them allow overnight parking due to a city ordinance. Worthington Minnesota is less than an hour further east, and on our way, so that became our target destination. 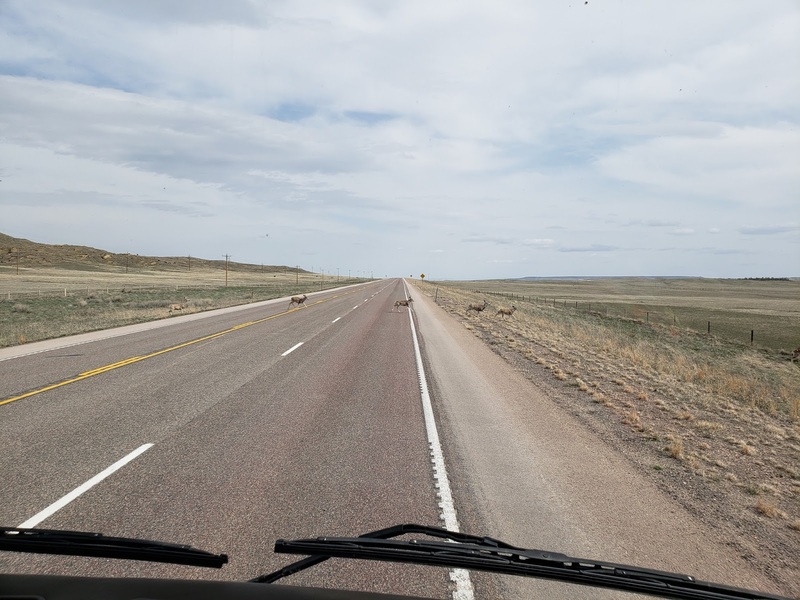 We first planned on parking at a restaurant on the edge of town, but it was too full of idling trucks and mud, so we backtracked into town and found their WalMart, which allowed overnighters. Three nights in a row off-the-grid!! Wow, that wasn’t planned at all, and neither was 650-mile day in a motorhome. On the bright side, we had only 100 miles to cover on Saturday morning, and we could make it to the reunion, where we had a good time seeing most (11 of 16) of Bob’s cousins and siblings. 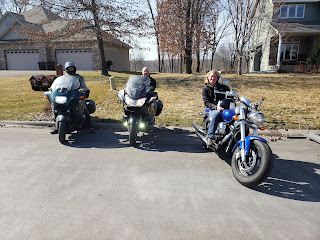 After that gathering broke up, we had another 100 miles to Brett’s place, where we had a 20-amp electrical connection waiting for us. 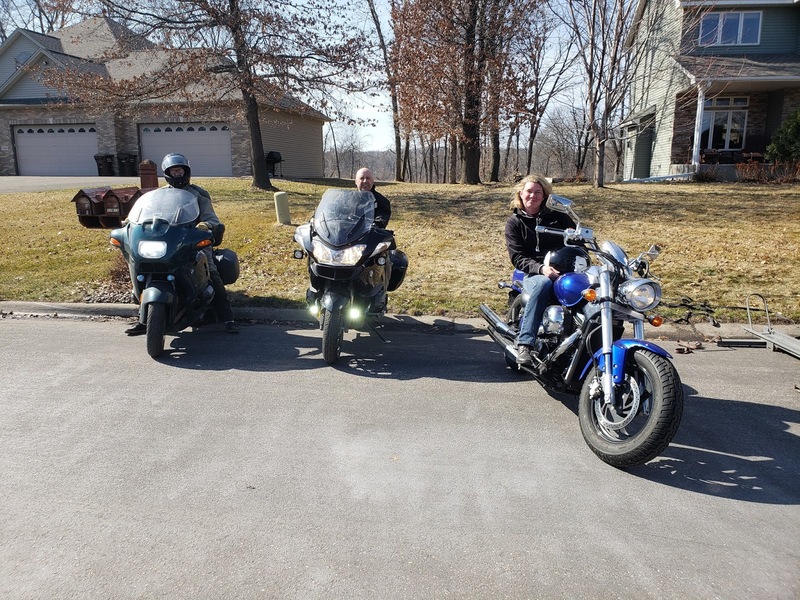 We spent 2 nights there, catching up on the activities of his family, touching base with Dave, and getting a spring-time motorcycle ride in. We needed to get to Duluth on Monday morning for a number of medical appointments, both for us and Paige’s mother. We parked for 3 nights outside Paige’s cousin’s house while all these appointments were taken care of. On Thursday, we re-parked the motorhome at the cabin. 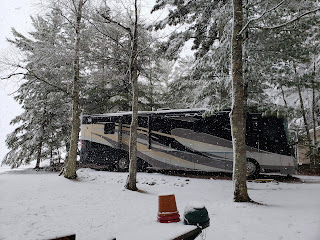 It was a fine spring day for settling in and unloading the motorhome. The lake is still frozen, but most of the snow is gone. We had a number of social activities back in the metro area for the weekend, so we only had a one-night stay at the lake. Friday morning we awoke to the pitter/patter of droplets on the roof, which quickly transitioned to large, wet snowflakes. By the time we left for Minneapolis there was a fresh inch or two of slippery snow on the ground. This in late April? ?.....only in Minnesota! We had a great weekend in the Twin Cities, with Anna’s History Day competition at the University, and Olivia’s soccer game at St Johns, plus breakfast with David, LaJoy, and Kaylen while Brayden had to work. We got back to the cabin in time to join Steve and Deanna for turkey burger supper. It was good to get back to the lake for a few days of quiet time before another round of medical appointments later this week. After waiting out the high winds in Arizona on Thursday, we left Paula and Tom’s place on Friday on our way toward Las Vegas. US93 north of I-40 gave us a different view of Arizona, with quite dramatic hills. We had originally planned to stop just short of the Nevada border, but the campground we had in mind was full. After calling a couple of others, we crossed into Nevada and stopped for the night near downtown Las Vegas. Saturday’s drive was also very scenic, up the Virgin River valley, back into the corner of Arizona, and into Utah. 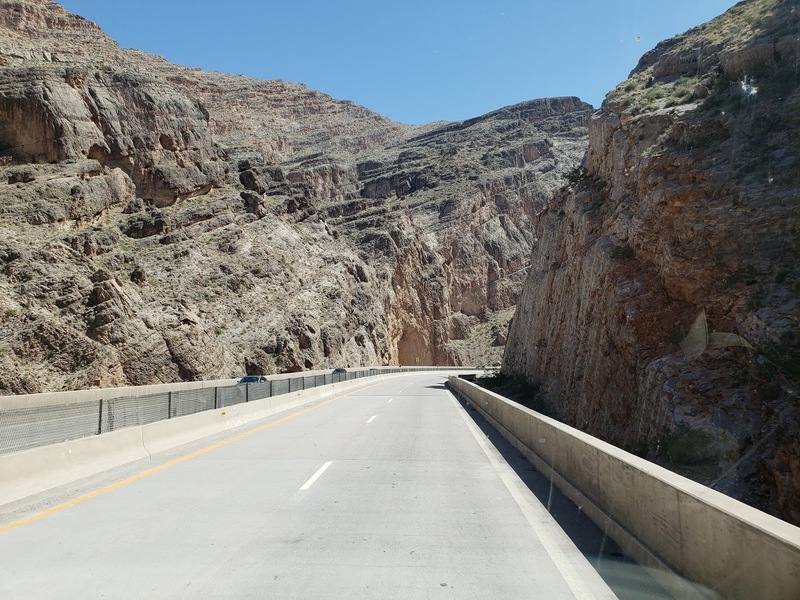 I-15 is in a wide valley. 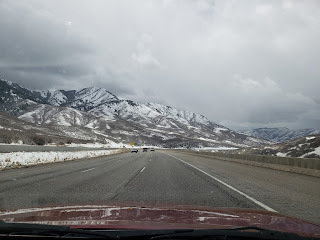 Years ago we had been in the next valley to the east on a motorcycle trip, so now we got the see the “other side of the mountains.” We stopped at Beaver Utah, which gave us a shorter day into Salt Lake City on Sunday morning. It was a gorgeous day and we got to see the mountains both east and west of us. Sunday afternoon we spent with family: Bob’s sister-in-law Dianne is in town, spending time with her granddaughter while Bob’s niece, Becky, is out of the country with a grad school group. We had a very nice afternoon, just visiting, and a pleasant dinner. Eden had made some fresh brownies for dessert. 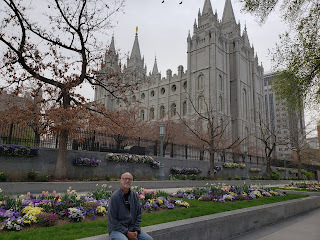 While Eden was in school on Monday, Dianne led us on a tour of the area: Great Salt Lake State Park, Antelope Island, and Temple Square downtown. We really appreciate her help because we wouldn’t have seen all of these on our own. Monday was a good day for sightseeing and not traveling because a new front was coming into the area with high winds, again. This time they were over 50 mph, so the motorhome stayed parked. As the front came through on Monday night, we got some of the snow that was forecasted. 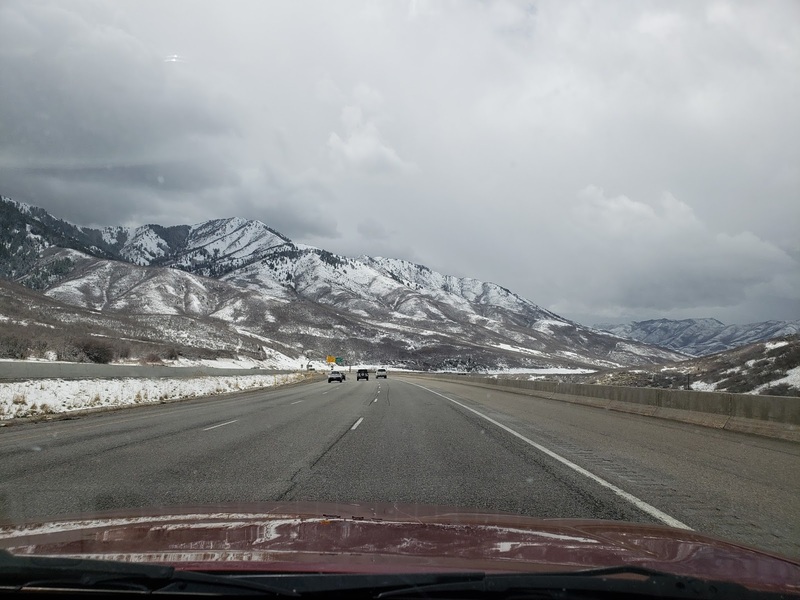 We changed our plans, staying in Salt lake City on Tuesday to wait out the weather again. Not the wind today, or even the snow. Some freezing temperatures came with the front and they are lower to the east, where we are going. Another day and the temperatures will be a little more acceptable. Tuesday was spent doing laundry, buying Comey’s new book, and sightseeing in Park City. Tomorrow will be a warmer travel day into Wyoming. * WINDS...Westerly winds of 20 to 30 mph gusting up to 45 mph. We will put up with gust to about 30 mph or so, but these predictions are a little too much, so we will sit it out for another day and leave Phoenix tomorrow. Since there is also a good sized snow storm now moving from South Dakota into Minnesota and Wisconsin, we have another reason not to hurry. We will give it time to melt before getting there.